Set in the countryside, nestled between its own private fishing lake and Lough Muckno, this wonderful lodge combines old 1800′s Ireland with the new. The decor in the original cottage has retained the old world charm with traditional key features that combine well with the modern the main living areas. The kitchen and utility have all mod cons including microwave, dishwasher, washing machine, tumble dryer, while the living room has TV & DVD Player plus a traditional Wood Burning stove surrounded by a beautiful stone fireplace. There are five spacious bedrooms, three double rooms – one with a disability friendly ensuite on the ground floor – and two twin single rooms. There is one downstairs WC and bathroom upstairs. The local pub provides a complimentary taxi service for guests! 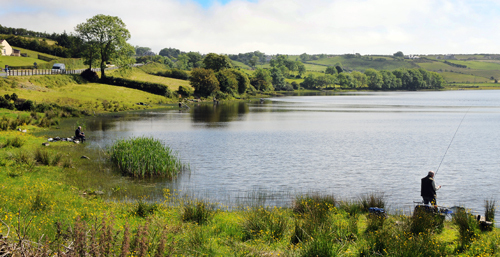 Castleblaney is a well established angling centre and best known for the many shorelines of prolific Muckno, which has great stocks of bream, roach, hybrids, a tench or two plus massive pike. Nearby are a number of smaller lakes including Gas Lake. Both Carricmacross and Ballybay are 9 miles away. Muckno Lodge has private fishing lake on Black Lake for guests only, where you can enjoy peace and quiet combined with a good chance of catching lots of bream by throwing a few balls of groundbait into your swim each day. Muckno Lodge also provides an outhouse drying-room, tackle room and a bait fridge.